Its easy to see the steps when there is no Doppler. 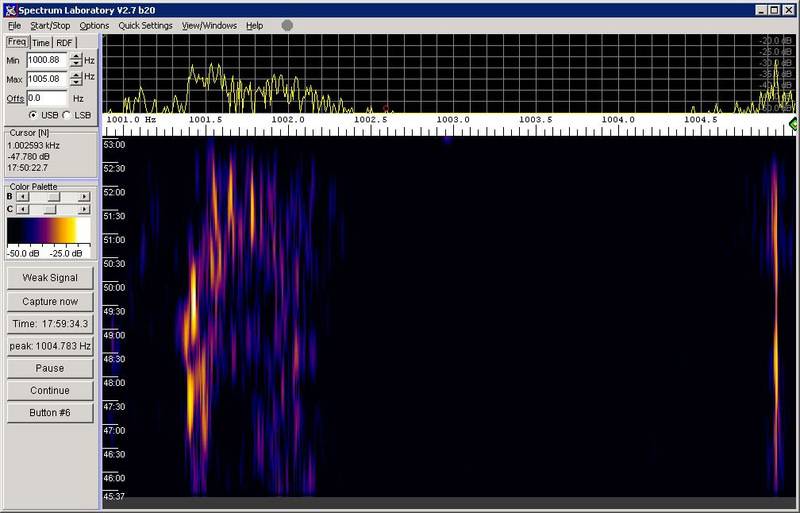 Screen capture by Reid, W0CNN of the K5CM 80 Meter 5 frequency run. Hard to tell the shift form the Doppler. W5UFZ AZ No copy on 160, K5CM 459 on 20 with qsb at 10 past the hour with nothing heard on the hour, 569 on 30 with qrn, 339 on 80- barely perceptible, W6OQI 589 on 80, and one level above mental telepathy on 40, 3-2-9.Strange conditions here tonight. Thanks for running the test. It's challenging. W6OQI CA Sorry I missed the 14055 part of the FMT. K6YAZ CA Signal seemed stronger on East heading for 20 meters. Was lot of spread on Speclab. On 30m Several peaks on speclab, but good signal to noise ratio. Good to be back doing this. W0CNN CO Great FMT Connie- 30M non-existant in CO, 20M good copy but really suffered from Doppler shift, 160M solid as a rock. 80M was strong but difficult to measure, as doppler shift was heavy last 2 minutes. WC sigs very strong in CO and very solid. Used all homemade equipment except transceiver- homemade GPSDO with my own firmware driving a homebuilt 995x DDS/QSD designed by WB6DHW acting as a calibrated reference marker. Captured both over the air with Kenwood TS-480HX with TCXO, audio sent direct to computer via M-Audio Delta 44. 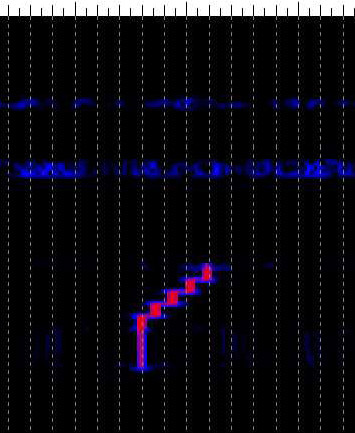 Post processed with SpecLab software from DL4YHF. Antennas used were SteppIR 3L on 20M/30M, W5GI Mystery Antenna on 40M/80M/160M. Thanks again! 73 -Reid- W0CNN. WB0LXZ KS Congrats to you Connie for your performance in ARRL FMT as well as that muv group FMT. N8OB OH It's hard to believe that the only band I could hear was 160 M. I thought my antenna was on the ground or?? K5CM OK Marvin, good signal on 80 meters, but 40 was on the weak side tonight. WA1ABI RI Good signals on 160 and 80. 40m WC very weak, inaudible by ear, buriedin SSB QRM. No sigs on 30 or 20. 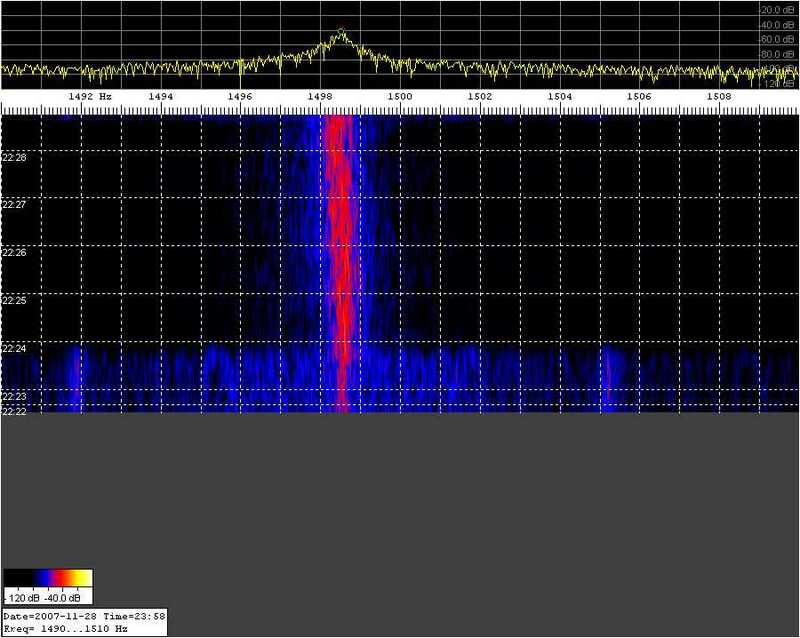 The 80m shift test was very challenging - 5minutes of wild Doppler. Thanks Connie and Marvin. W4UK SC This is my first attempt at your FMT. I missed all but the 20 meter measurement. Thanks for providing the FMT. Jerry W4UK. N5PWG TX 20m very weak signal. 30m nothing heard except a W7 in AR and a W6.80m did not detect any shift.WC: good sigs. W3JW VA Doppler was everywhere except 160 meters. 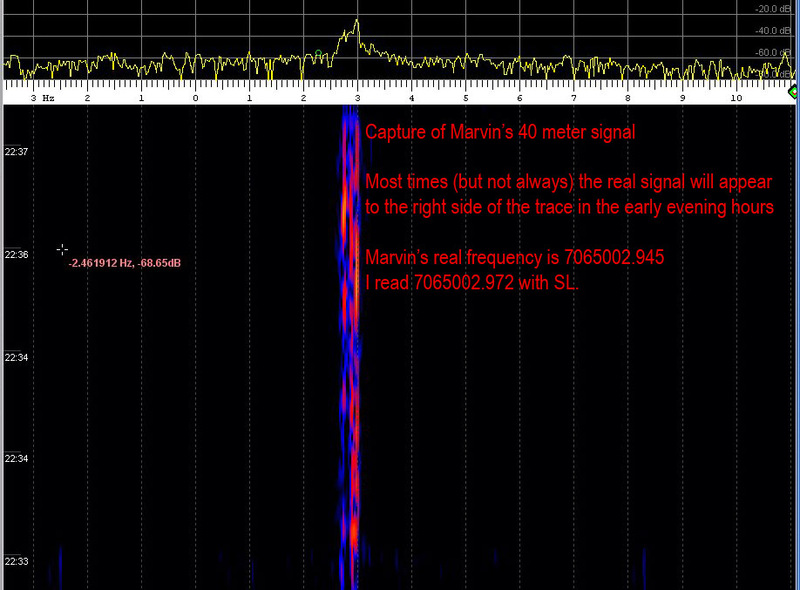 No signal heard on 20 meters and the 30 meter signal was so weak no audio was heard and the waterfall trace wasn't recognized until 7 minutes into the test. Other signals were of medium strength with noticeable QSB. N3UC VA Nothing heard on 10 or 14MHz tonight. Used a new method, we will see if it worked. From the good readings over the last two FMT's it seems winter time conditions have returned. Although the 80 meter test seemed to be an interesting thing to do, it seems most had a difficult time with the Doppler and the shift combined. Maybe increasing the shift would help, or as Jeff, W3JW suggested, going to 160 meters. 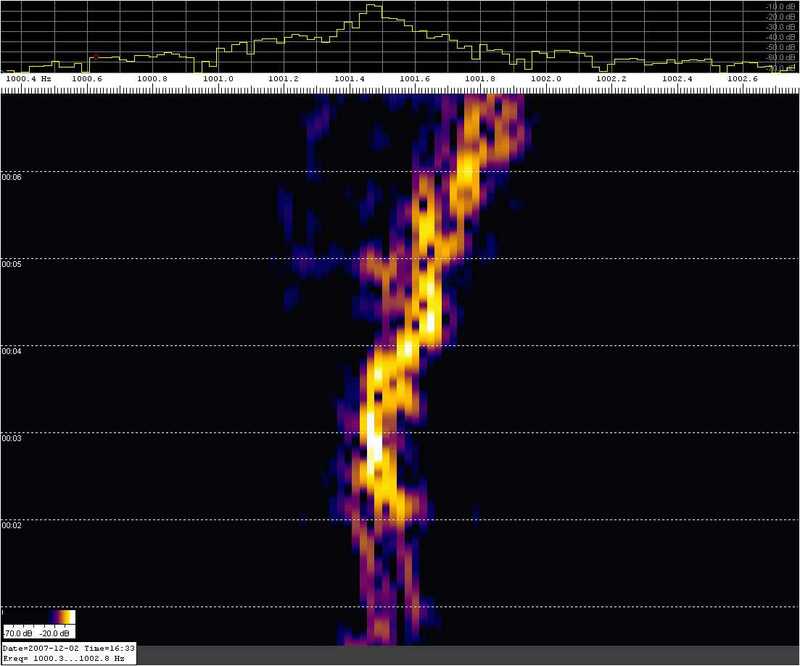 Stations copying K5CM 80 meter run to .1Hz or better, or total shift to .050 Hz or better. Stations copying W6OQI West coast 80 meter run to .1Hz or better. Stations copying W6OQI West coast 40 meter run to .1Hz or better. A HP-Z3801 GPS clocks a HP-3336B and a PTS-250. A small 10 db transistor amp follows and drives a 12BY7 / pair 6146. Then to the final amplifier, a Dentron 2500 at 300 watts output except on 30 and 17 meters where the power is 75 watts. There are no mixers or any device in the chain of amplifiers that might impact the accuracy of the HP-Z3801. As a reality check, I periodically log the HP-Z3801 against WWVB. I monitor each transmission with a completely separate receive system to look for any instability or short term drift. The separate system is not locked to the GPS but calibrated by the GPS system before the FMT.